Credits and payments on account are both recorded as manual payments made by a contact. Once recorded, the payments can be applied towards future invoices. You can also provide discounts which reduce or eliminate the invoice balance rather than apply a credit towards the full invoice. Discounts can be set up for selected event registration types and membership levels, or manually applied to specific invoices. To record a credit on account, you record the payment without first selecting an invoice. To record a payment without applying it to an invoice, hover over the Finances menu and select the Payments & refunds option. 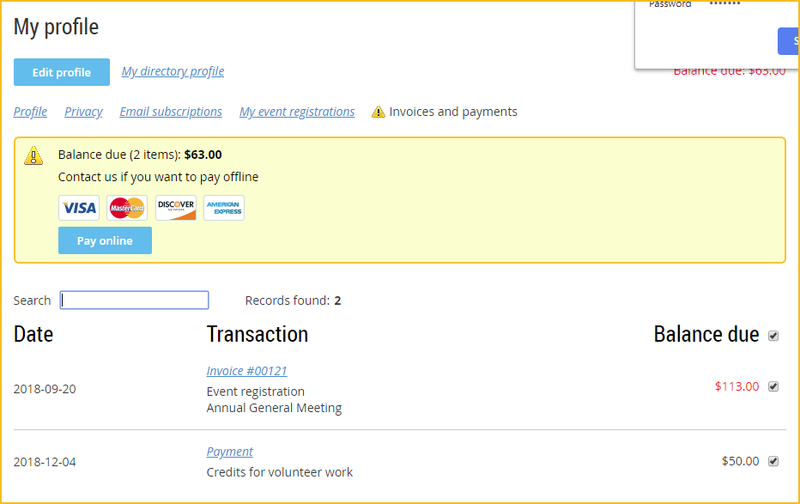 From the Payments & refunds screen, click the Record payment button. From the Record payment screen that appears, select the contact you want to record the payment for, enter the payment amount, select the payment tender, and record any internal notes. You might want to use custom tenders such as "Credits for volunteer work" so you can track credits and payments on account. When you are finished entering the payment details, click the Save button. The payment amount will be applied to the contact's account, possibly resulting in an overpaid balance (depending on whether the contact has unpaid invoices). Your contacts can apply their credits to outstanding invoices from the Invoices and payments tab of their mobile profile.